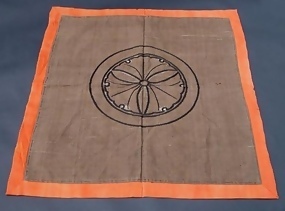 This type of fukusa is a covering placed over a gift at the time of a gift-giving ceremony between families. A fukusa with the crest decoration is very practical because it can be used for the different occasions. Beautiful old tapestry weave (hand woven). The dimensions: 25 1/2" x 27"